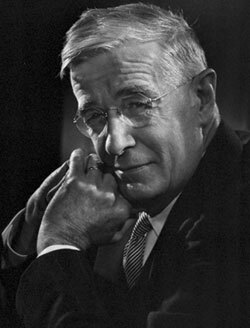 Vannevar Bush was born on March 11, 1890, in Everett, Massachusetts, in a family of the Universalist minister—the Reverend Richard Perry Bush of Provincetown, MA, and Emma Linwood (Paine) Bush. Vannevar had two sisters. As a child, he was sickly and was occasionally bedridden for long periods of time. Still, he was self-confident and sometimes got into fights with other boys. He once said, "all of my recent ancestors [before my father] were sea captains, and they have a way of running things without any doubt. So it may have been partly that, and partly my association with my grandfather, who was a whaling skipper. That left me with some inclination to run a show once I was in it." Bush did well in the primary school, where he showed an aptitude for math and a love to tinker. Later his father became a pastor at Chelsea, MA, where Vannevar attended the high school. At he same time he has a versatile workshop in his home. After graduation, he went off to Tufts College to study engineering. Half of his expenses were paid by a scholarship, to pay the other half, he worked as a tutor and aid in the math department. Vannevar studied earnestly and earned a master's degree in the time it usually takes to earn a bachelor's degree. In 1913 he graduated the college as M. S. and went to work for General Electric, testing electrical equipment. In 1914-1915 Bush went to taught mathematics at Jackson College. In 1915 he entered the Massachusetts Institute of Technology (MIT) electrical engineering program. Spurred by the need for enough financial security to marry, Bush finished his thesis in less than a year. On 5th of September, 1916, he married at Chelsea, to Phoebe Davis, a Chelsea girl, whom he had known since Tufts. The family had two sons: Richard Davis Bush and John Hathaway Bush. At the end of the same 1916 he had earned a Doctor if Engineering degree (from MIT and Harvard University, jointly) and became an assistant professor of electrical engineering at Tufts. While at Tufts Bush enjoyed his first experience as an inventor, securing a patent for a device for land surveying, which he called the profile tracer. It looked something like a lawnmower with two bicycle wheels and a pendulum, and as was pushed over land, integrating and recording horizontal and vertical measurements. Vannevar thought it would be commercially successful, but it never caught on. The young man learned many things from this failure—to become a real engineer he needed to learn more than math and physics. He needed to learn how to effectively deal with people. The same difficulties faced Bush during the WWI, when he was working for US Navy, to which he proposed his idea for a device, that would use magnetic fields to detect submarines. His device proved to be successful in testing, but Navy officials, did not deploy the device correctly and it proved virtually useless in combat. Bush again learned that a successful engineer also had to be a good politician. In 1919, Bush left Tufts and went to MIT's electrical engineering department as a professor of electrical power transmission. Starting from 1925, Bush began construction of mechanical devices for performing integration. First was the Product Intergraph, next was the Differential Analyzer, an analog computer that could solve differential equations with as many as 18 independent variables. It actually used large gears and other mechanical parts to solve equations. In 1931, he completed the first differential analyzer (see the lower photo). At the same tine, Bush and team at MIT develop the "network analyzer", a system for setting up miniature versions of large and important electrical networks. Later Bush constructed an improved Differential Analyzer, built by electronic tubes, which was used intensively during the WWII. In 1922, Bush, his college roommate, Laurence Marshall, and a colleague of Bush from the company Amrad (a small company for radio devices, where Vannevar served as a consultant), Charles G. Smith, set up the Metals and Controls Corporation, for producing thermostats and thermionic tubes. Later the company managed to market successfully a device, called the S-tube. This was a gaseous rectifier, invented by Charles Smith (the patent was purchased by Amrad), that greatly improved the efficiency of radios, eliminating the need for radio batteries. Bush made much money from the venture. The company, renamed Raytheon in 1925, became a large electronics company and defense contractor, and still exist now as a major American defense contractor and industrial corporation. Bush also worked on developing machines that would automate human thinking. Specialization in just about every field of science was creating a glut of information. Something was needed to help sort through the growing store of accumulated knowledge. In the 1930s microfilm, which had been around for some decades, was growing in popularity as a storage device, especially among librarians. Bush, who was a photography enthusiast, was quite interested in this resurgent technology. He proposed to build a machine for the FBI that could review 1000 fingerprints a minute. They however turned him down. In 1938 Bush and John Howard built and patented the rapid selector, a machine designed for high-speed referencing of information, stored on microfilm. In 1945 Bush wrote an article, describing a device (called memex), the prototype of the modern hypertext systems. Bush became vice-president and dean of engineering at MIT from 1932 until 1938. In 1938 he accepted a prestigious appointment as President of the Carnegie Institution of Washington. The institution spent $1.5 million annually on research. The presidency of the institution came with a lot of prestige. The president influenced the direction of research in the U.S. and informally advised the government on scientific matters. In 1940 Bush was appointed Chairman of the President's National Defense Research Committee, and in 1941	Director of the Office of Scientific Research and Development. These two appointments made Bush a central figure in the development of nuclear fission and the Manhattan Project (the atomic bomb). In 1944 President Roosevelt asks Bush for recommendations on the application of "lessons learned" from WWII to civilian, peace-time activities. Bush submits the article Science, the Endless Frontier in response to Roosevelt's request. He outlined the importance of continued support for research. He called for a National Research Foundation that "should develop and promote a national policy for scientific research and scientific education, should support basic research in nonprofit organizations, should develop scientific talent in American youth by means of scholarships and fellowships, and should by contract and otherwise support long-range research on military matters". It was this proposal which set off events leading to the development of the National Science Foundation in 1950. During the next decades Bush was appointed a Chairman or Director of many institutions of critical importance for USA: in 1946—Chairman of the Joint Research and Development Board of the War and Navy Departments; in 1947—Chairman of the Development Board of National Military Establishment; in 1947—director of AT&T; in 1957—Chairman of the MIT Corporation, from 1957 to 1962 he was chairman of the large pharmaceutical corporation Merck & Co., etc. 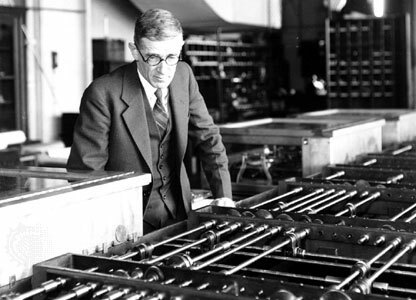 Vannevar Bush died from pneumonia after suffering a stroke on June 28, 1974, in Belmont, Massachusetts.